Skype got the latest update for the iOS app with new specific features. This update of iOS Skype app is updated by Microsoft today. This update is available for iPhone and iPad directly on the Apple’s App Store. The updated Skype app is now supporting the SiriKit. This can enhance the ways to use the Skype. With this, the user can able to call any user on Skype with simple voice commands. For example, Just simply say “Call (Contact Name) on Skype. If the spelled contact is available on the iPhone or iPad, and rest will take care by Siri and Skype. Similar to the Normal call Siri will ask your confirmation as if you got the right contact or not. Microsoft’s Skype is now taking the advantage of the iOS 10’s CallKit. So the incoming calls on the Skype will display like the regular calls on your lock screen. This is the easiest way to switch between not answering the Skype calls and the regular calls. 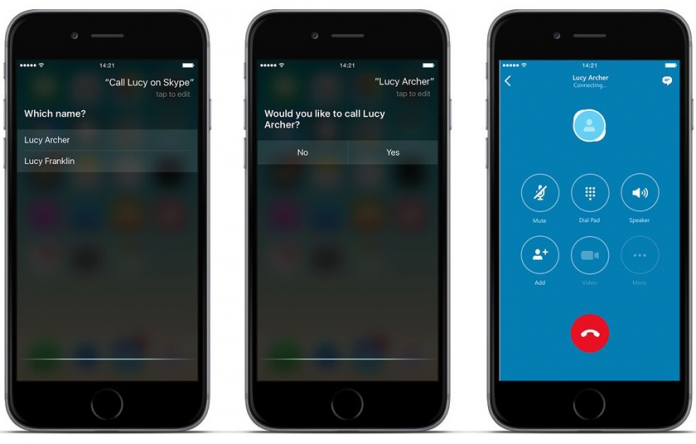 Microsoft stated that both the functionality of SiriKit and CallKit would be coming to the Skype for Business iOS apps in October month. The contacts of the Skype are saved on your iOS device, and this simplifies to initiate the Skype Video calls or audio calls even the Messaging on Skype without even launching the App. Use Siri commands to make a quick Skype call. Answer the Skype calls straight away from the lock screen as a regular phone call. Skype contacts are stored into the contacts list on the device. Users can more easily differentiate between your contacts and bots in the contacts list. You have to get the iOS 10 for the efficient use of this Skype update and appreciate it. So far this is the big update for the Skype.